Preheat oven to 300° F. Cream together butter and icing sugar until light and fluffy. Stir in flavorings , ground almonds and flour and mix well to form dough. 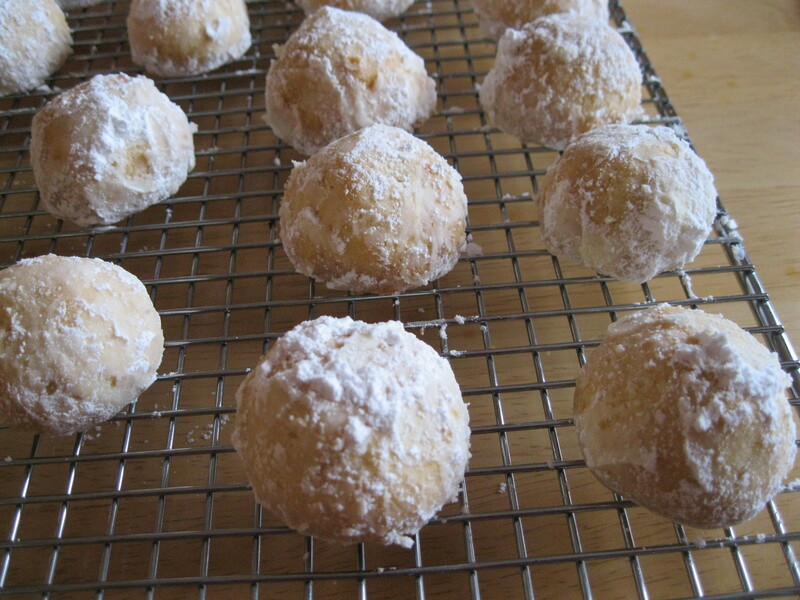 To form cookies, take about a tablespoon of dough and begin to form a ball. Push one half of a cherry into the ball and pinch the dough together to hide the cherry, and then finish forming the ball. It should be about 1 1/2” in diameter. Place cookies on ungreased cookie sheets and bake for about 20 minutes. Do not brown the cookies, they should be just starting to have a hint of color when they are done. Cool in the pan for about 4 minutes, then gently roll the balls in icing sugar and allow to cool completely on wire racks. The recipe should yield about 30 cookies.